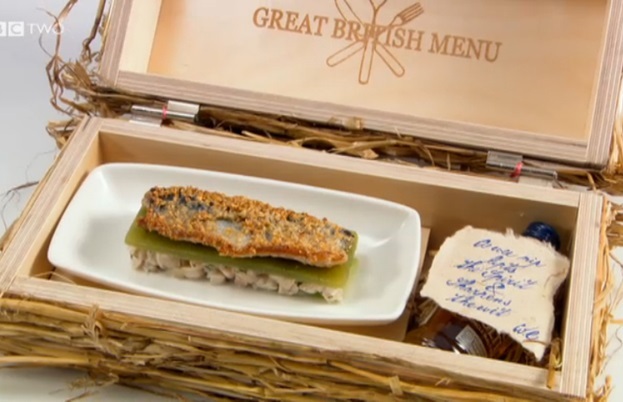 Week seven of Great British Menu 2014 finished with the Scottish finals. On Thursday we said goodbye to Neil Rankin, leaving newcomers Jacqueline O'Donnell and Stevie McLaughlin to compete for a chance to serve veterans at a banquet marking the 70th anniversary of D-Day. This week, our judges, Prue Leith, Matthew Fort and Oliver Peyton, were joined by fourth guest judge, Jim Radford, thought to be the youngest serving member of the Merchant Navy on D-Day. The dinner kicked off on a high note with Jacqueline’s "Not Quite Your Mammie’s Liver & Onions” starter, consisting of onion puree, calve’s liver, granola made from pecans and paprika, onion tuile garnish and finally, pots of cassis sauce on the side. “The dish itself is extremely brave,” said Oliver. “This is absolutely divine,” said Prue. “This is gourmet liver,” said Jim. “The crunchiness of the granola on top is a master stroke,” said Matthew. Stevie’s starter, “Normandy “1944”, made with cured ham and wilted spinach, calvados butter, artichoke hearts, normandy camembert mousse and crispy onions, was praised for its idea but not its execution. Matthew called it an “ingenious acknowledgement of the French side of D Day.” However, Prue wasn’t a fan, and Oliver agreed: “It’s a lot of French ingredients on a plate which don’t really work well together." Jacqueline’s fish course, “Black Market Silver Darlings”, made with herring, pickled cucumber and whisky served in a hay bale presentation, was a hit, and not only for the whisky (though it certainly helped). 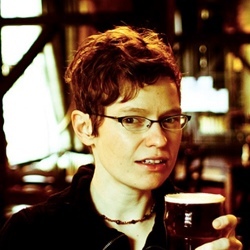 "She’s combined the background story with a contemporary piece of cooking," said Matthew. “This is perfect for the fish course,” said Prue. Stevie’s main dish, “A Letter From Home”, was made to an authentic wartime recipe, including lard and potato pastry, beef wellington, chicken and mushroom mousse over pancakes and fillet of beef encased in puffed pastry. The presentation was pleasing, including the letter that came with it. And the food was outstanding according to the judges. “Wow…that beef is the perfect colour,” said Prue. “As near to perfection as you can get,” said Jim. Jacqueline’s main course was her “Homecoming Platter”: ham and savoy cabbage served in mess tins with apple potato gratin, cured pork soldier, pork cutlets and parsley cream sauce. The dish received high marks for presentation. “Wow that looks good,” said Prue. “The word heart-stopping comes to mind,” said Matthew. “Each thing is a thing of great bueaty,” said Oliver. However, was it right for the banquet? “It’s heartfelt but it’s heart-stopping - it’s overwhelmingly rich,” said Matthew, to which Oliver said “you’re all going soft”. Still he agreed it’s not a banquet dish. 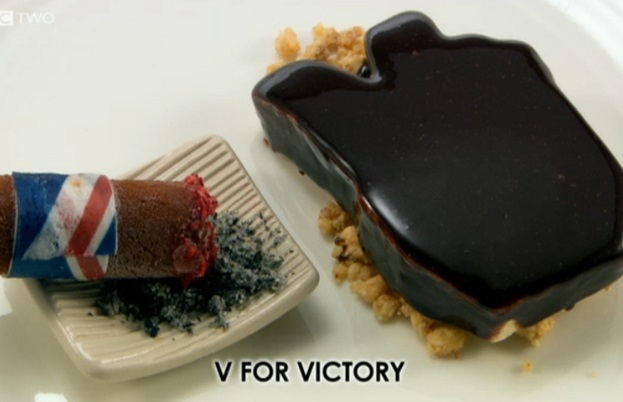 Just one course to go and it was Stevie’s last chance to wow the judges with his dessert, “V for Victory”, consisting of white chocolate and coconut crumb, poppy seeds, chocolate cigars and parfaits. The audible “mmms” from all of the judges said it all. “A real level of skill in this,” said Oliver. “Not the most original piece of gastromny but clearly a chef who has enormous ability,” said Matthew. Finally, it was time for Jacqueline’s dessert, “Candle of Remembrance”, made with a white chocolate wax effect and wick. The judges praised her ingenuity and modelling skills, but that’s about where the compliments ended. “The idea seems bizarre,” said Matthew. “The chocolate isn’t great,” said Prue. “The main objection is I just don’t like the taste of it,” said Jim. Decision time and the judges conceded this was an extraordinarily close race, with only one point difference between the two chefs. In the end, winning “by the skin of her teeth” was Jacqueline. “We all loved your herring dish,” said Prue who gave it a 10, “but [the candle dish] almost cost you the competition.” No doubt we’ll be seeing some tweaks to this dish in the National Final. Until then, congratulations, Jacqueline!